A little bit about HMS Leopard in the Great Mutiny at the Nore. In the afternoon of 9th June 1797, a meeting of the loyal officers, men and Marines in HMS Leopard agreed that they should take back control of the ship from the mutineers. The meeting had been convened following concerns about the increasingly militant demands of the ringleaders and rumours about sailing to join the French and Dutch at Texel. The men agreed to divide themselves into three teams. One, under Lieutenant Joseph Robb would move two 12pdr long guns in the part of the upper gundeck screened off to form the wardroom away from their gunports and aim them down the gundeck. A second party would disable the 24pdr long guns on the lower gundeck by filling the vents with vinegar and then cut the anchor cable, while a third party would go aloft and set the sails. At a pre-arranged signal the plan was put into action. The wardroom screens were taken down and faced with large cannons filled with grapeshot and unable to fire the lower gundeck guns, the mutineers had no choice but to surrender and the ship made good her escape and rejoined the rest of the North Sea Fleet at Yarmouth. In the Courts Martial which followed the collapse of the Mutiny, 42 of HMS Leopard's men were tried. Of those 42 men, nine were convicted of whom seven were hanged from her fore-yard, two were sent to the prison hulks and the rest were acquitted. HMS Leopard was a Portland Class 50 gun Fourth Rate Ship of the line, built at the Sheerness Royal Dockyard. Up until the mid-1750s, the 50 gun fourth rate ship of the line was the smallest of the Royal Navy's ships of the line. From then, they were seen as being too small and weak to stand in a line of battle against the larger and more heavily armed French and Spanish ships of the line. They continued to be of use however, in the shallow waters off Northern Europe and North America where the larger ships of the line had difficulty operating safely and they were of particular use against the smaller and less heavily armed ships of the line operated by the Dutch Navy and for that reason, the Royal Navy continued to build and operate small numbers of them into the early 19th century. At the end of the 18th century however, a new type of warship appeared, the Heavy Frigate. These ships, mounting upwards of 40 guns and carrying 24pdr long guns and heavy carronades both outsailed and outgunned the 50 gun ship of the line and by the end of the Napoleonic Wars in 1815, they had largely disappeared from front line service in the Royal Navy. Those ships which avoided being broken up or converted into hulks continued in service in supporting roles, as troopships or storeships. HMS Leopard was originally ordered on 16th October 1775 and was laid down at the Portsmouth Royal Dockyard in January 1776. Work did not progress beyond that and the ship was later re-ordered from the Royal Dockyard at Sheerness and was laid down there on 7th May 1785. Construction work was delayed a number of times due to changes in the management at Sheerness, where the supervision of work on her construction ended up being undertaken by no less than three Master Shipwrights; Mr Martin Ware until promotion took him to the position of Master Shipwright at Woolwich Royal Dockyard in December 1785, Mr John Nelson until he replaced Mr Ware at Woolwich in March 1787 and finally Mr William Rule. It was William Rule who supervised the final stages of construction and the launch of HMS Leopard. In addition to this, the Sheerness Royal Dockyard was busy with the fitting out of the many smaller vessels being built in shipyards along the south Kent coast, which had a higher priority than an already largely obsolete ship of the line. By the time the ship was launched into the Swale on 24th April 1790, the French Revolution had occurred. 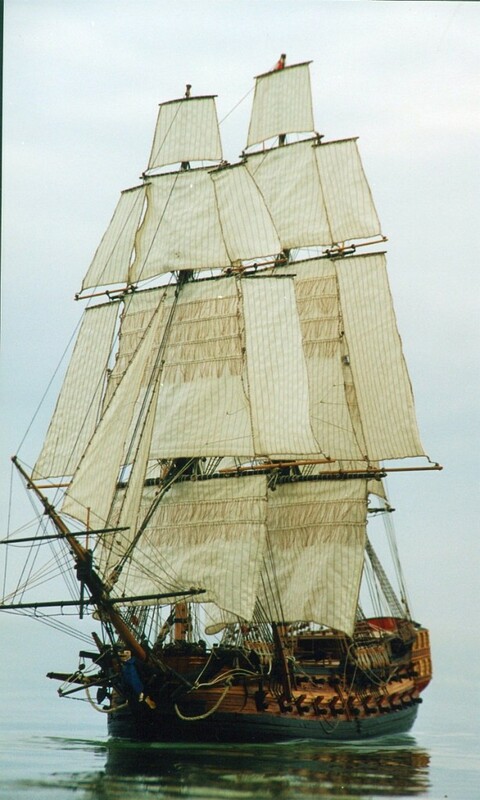 In June 1790, the ship commissioned under Captain John Blankett. When she was finally completed, HMS Leopard was a ship of 1044 tons, she was 146ft 5in long on the upper gundeck, 120ft long along the keel and 40ft 8in wide across her beams. She was armed with 22 24pdr long guns on her lower gundeck, 22 12pdr long guns on her upper gundeck, 2 24pdr carronades and 2 9pdr long guns on her forecastle, 4 9pdr long guns and 4 24pdr carronades on her quarterdeck with 6 12pdr carronades on her poop deck. In addition to her main guns, she carried a dozen hald-pounder swivel guns attached to her quarterdeck and forecastle handrails and in her fighting tops. She was manned by a crew of 350 officers, seamen, boys and Royal Marines. 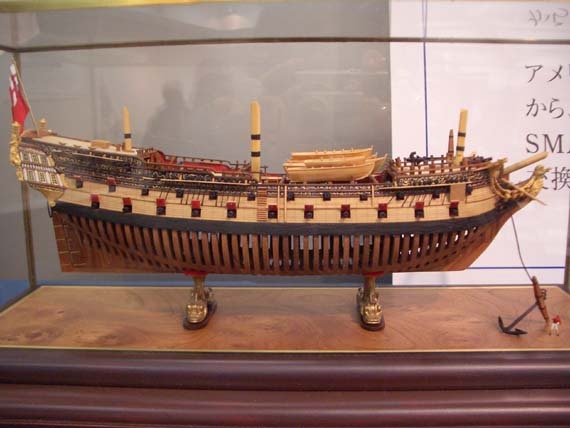 A model of HMS Leopard showing her frames. Despite being on the verge of obsolescence, HMS Leopard had an active career. On 12th May 1796, she took part in the capture of the Dutch 36 gun frigate Argo off Texel, in company with HMS Phoenix. The Dutch frigate had been sailing in company with three brigs and these were chased by the frigate HMS Pegasus and the brig HMS Sylph. The brigs managed to evade capture. On 18th February 1797, she captured the French privateer Victorieux. May of 1797 saw the ship at the Nore, where the Great Mutiny there broke out on the 12th. HMS Leopard, in company with the 64 gun 3rd rate HMS Repulse escaped from the mutiny on 9th June, coming under fire from the mutineer-controlled ships HMS Monmouth and HMS Director as they did so. The following year saw the ship operating in the Indian Ocean and the Red Sea. 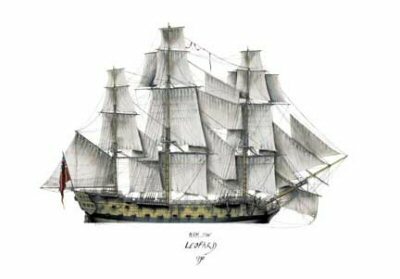 On 26th October 1798, HMS Leopard captured the French privateer Apollon in the Indian Ocean. On 22nd August 1800, she captured the French privateer Clarisse in the Red Sea. She landed troops at Suez on 22nd April 1801 as part of the campaign against the French army stranded in Egypt after Nelson's victory at the Battle of the Nile in 1798. 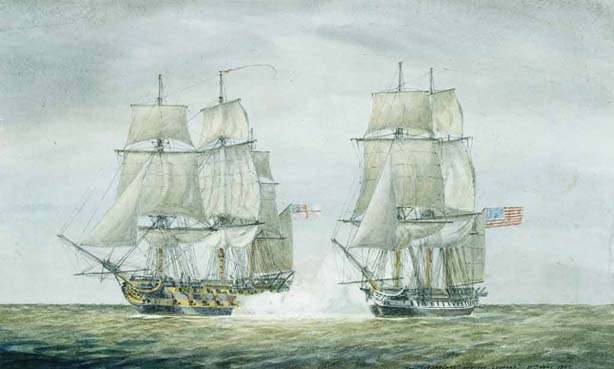 By 1807, the French were attempting to provoke the United States into joining them in the war against Great Britain and as part of an attempt to intimidate the USA into deciding otherwise, HMS Leopard was sent to Halifax, Nova Scotia to join British forces patrolling the eastern coast of the USA. In the spring of 1807, the Royal Navy had received information that a significant number of British deserters were hiding amongst the crew of the large American frigate USS Chesapeake. 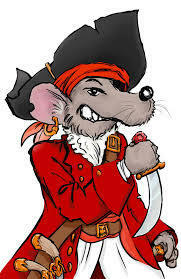 Seamen on the run from the Royal Navy had discovered that they would be offered asylum on American ships and be given a chance to earn US Citizenship. On 1st June 1807, Commander-in-Chief Halifax Station issued orders to the effect that the USS Chesapeake was to be stopped and searched if intercepted outside American territorial waters. On 21st June 1807, HMS Leopard, in company with the 74 gun 3rd rate ship of the line HMS Bellona and the 36 gun frigate HMS Melampus anchored off Cape Henry, Virginia and lay in wait for the USS Chesapeake. They were joined the following day by the large 74 gun 3rd rate ship HMS Triumph. By 1810, the ship was operating in the Indian Ocean again and arrived off Mauritius in company with the 36 gun frigate HMS Iphegenia and the ex-French 32 gun frigate HMS Magicienne in early April in order to support the campaign to take that island from the French. She wasn't there long, in May, she was dispatched to the Cape of Good Hope to replace the 64 gun 3rd rate ship HMS Raisonnable, which had returned to the UK. Her career as a front line warship was over by 1811. Fourth Rate ships of the line like HMS Leopard were by this time, totally outclassed by the Heavy Frigates then entering service. HMS Leopard, in common with other surviving, similar ships, was relegated to second-line duties such as carrying stores and troops. Between March and April 1811 HMS Leopard was converted at the Chatham Royal Dockyard to a 26 gun troopship, when her lower gundeck guns were permanently removed and the gunports sealed shut. She spent the rest of her career carrying troops, stores and prisoners to and from the far-flung corners of the by now rapidly expanding British Empire. HMS Leopard's career came to an end on 28th June 1814. Whilst carrying 475 soldiers of the Royal Scots Guards from the UK to Quebec, she ran aground in fog on Anticosti Island off the coast of Quebec. Despite efforts to refloat her, the ship couldn't be saved. All aboard the ship escaped unharmed but the ship was lost. A picture of a beautiful radio-controlled model of HMS Leopard under way.